Summary: A shakier episode succeeds thanks to a well though-out thematic throughline and exciting new dynamics. Arsenal and Diggle confront Laurel about trying to step into her sister’s shoes and warn her to stop before she gets herself killed. However, when Brick kidnaps the city’s Aldermen and threatens to kill them all unless the police evacuate The Glades, it’s all suits on deck. Arsenal and Black Canary work together to take Brick down, but fail, resulting in the death of one of the Aldermen. Meanwhile, Ray steps in to help Lance and the police force fight Brick by offering to help militarize the force. Brick attacks the Mayor, Quentin, Laurel, Ray, and Felicity in one of the meetings, though, and while Laurel and Ray get a taste of the down-and-dirty surprises of vigilantism, it convinces the Mayor that they’ll have to let Brick win. The events make Felicity realize that Ray and Laurel have both been fighting to honor the dead, when in reality, their true intention should be to protect the living, which is what Ray was doing by offering to help the police. She convinces Laurel to rejoin the cause, and Felicity brings the whole of Team Arrow together to save the Aldermen and prevent the Glades from being abandoned. 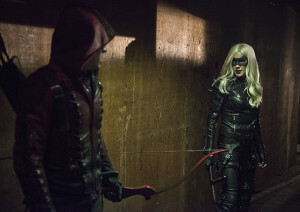 Felicity guides Diggle, Arsenal, and Black Canary into the Glades where they are able to successfully rescue the Aldermen, albeit not smoothly. However, even their heroics don’t change the Mayor’s mind, and she has the police abandon the city anyway. Quentin sees footage of Black Canary on TV and believes it’s Sara, so Laurel uses Felicity’s voice modulator to imitate Sara’s voice and convince him she’s around. Meanwhile, Oliver and Tatsu hide as the League tracks down Maseo. While they are able to take out the people confronting Maseo, he still goes to return to the League, leaving Oliver and Tatsu to make the trek back to Starling. Malcolm finally tells Thea that Ra’s al Ghul is after him and his family and that’s why they must leave town immediately, but she wants to stay and fight him together. Chase, the DJ who courted Thea, is revealed to be a spy working with Maseo to keep tabs on Malcolm and Thea. One of the points we brought up ad nauseum early in the show’s run was how it flipped the typical superhero set-up from the get-go. 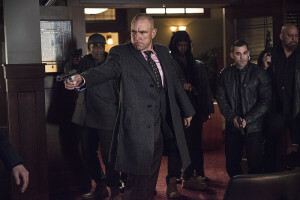 The pilot of Arrow introduced Oliver Queen as an already well-oiled machine, which made the earlier episodes initially seem flawed, but unfolded as being a wholly purposeful set-up. As it went along, Arrow stopped being about this archer vigilante saving his city, and instead became about a shell struggling to be revitalized as a man. The often unspoken brilliance of Arrow‘s structure has the flashbacks run the complete opposite direction; past Oliver broke down and lost all of his humanity, and it directly parallels present day Oliver reclaiming his humanity. Sometimes that structure doesn’t lend to the best episodes, but it does work as the sum of the show’s parts, at least so far. Instead of a show where Oliver Queen had to work his way up to being a vigilante, he already started there; the the more interesting journey has been his journey to human heroism without downplaying his efficiency as a vigilante. It’s worth putting that in perspective to see how truly daring these episodes are at their core, even if they aren’t on the surface. It goes deeper than “the main character is MIA” — that’s not unheard of, and in fact we’ve already seen episodes of Arrow with very little Oliver. The difference is that the nature of Oliver’s disappearance, the assumption of his death and the events that have brought forth massive status quo changes for the left behind characters, results in a completely different show with the same characters, essentially. And ironically, this new Arrow show is what we were probably expecting from Arrow from the get-go: a shaky-but-well-intentioned ragtag force of good that has a lot to learn. “Midnight City” finally plays a more classic early second act of a superhero origin story, just without its title character. It’d be wrong to say “Left Behind” was the “origin story.” Laurel has been on a long road over the past three seasons, and Roy has been a costumed hero for a while, albeit one with a huge safety net in Oliver and Team Arrow that he’s only now shedding. But “Midnight City” is definitely the opening of the second act, where the newly designated hero struggles with the down and dirty. You have to take down the purse snatchers, run into fires, and make a name for yourself as a hero before moving up to the Big Bads. As Laurel’s fall from her first building jump — a moment that’s both self-aware and sardonic, but also true-to-life — proves, even the simplest-seeming battles will pose a challenge. “Midnight City” still messes with the formula, though, in that Laurel and solo-Roy’s “purse snatchers” are violently dangerous, the stakes are high, and the city is in a much larger scale of turmoil. The early stage of the hero is forced to play with the impossible final act villains, which lends to a whole lot more questions of if this method is worth it. Black Canary and Arsenal’s first intentional team-up is a catastrophe, and while neither of them make particularly stupid decisions, they are both fundamentally responsible for the vicious death of the Alderman. Roy makes a mistake Oliver could have made, but probably wouldn’t have, and Laurel sees the true consequences of her actions if she fails. While this episode has some mildly uneven pacing at points, it’s solid in setting up and delivering on situations that makes these things feasibly work, without making Laurel and Roy out to be total screw-ups. Roy has been doing this a while, remember, so Laurel isn’t totally on her own — but while he’s great at the parkour and the combat, his tactical skills are clearly lacking. Laurel birthed the Black Canary persona out of a self-viewed necessity, and “Midnight City” goes a long way to show that while she may not be the best man for the job, what matters is that a man for the job was sorely needed. The episode smartly sets up a story where the police are unable to make a dent, and where costumed heroes aren’t a wish-fulfillment so much as a logical solution. Team Arrow here takes the Young Justice approach, acting as a covert ops group, doing their work without bureaucratic interference and without consequence for the city government. It helps shake Laurel and Felicity out of their heroic BSODs, and in particular, recognize what they’re truly fighting for. Felicity similarly stayed with Team Arrow because she similarly wanted to do good, at first. But season 3 has severely broken her emotionally, particularly in that she fell hard for a the man at the center of the mission and subsequently lost him. Matt mentioned last week that Felicity’s desire to disintegrate Team Arrow because Oliver is gone could have implications that weaken the character, in that it condenses her motivations from “wanting to be a force for good” to “wanting to work with Oliver.” “Midnight City” addresses this head-on and exposes it as a weakness, as losing Oliver absolutely doesn’t mean everything else is lost along with it. Felicity isn’t wrong to worry about her friends dying, but that assumes that’s all there is to it. That’s where Ray factors in, with his use as an analogue to Oliver in full play. Felicity sees Ray dying in battle just as Oliver did, using his death as her own crusade to stop stupid people from putting on those damned masks and becoming vigilantes. But dying as a victims and dying as heroes who knew full-well what they were getting themselves into are two vastly different things, and the affect these good-intentioned people could have on Starling could match what the Arrow was in the process of doing. If, of course, they can get their heads on their shoulders. So, just as Felicity nearly destroyed Team Arrow in her departure, she builds it right back up in her re-entry. “Midnight City” continues what “Left Behind” started in playing up some usually unseen dynamics, in this case forming a pivotal revelation around both Laurel and Felicity. Both arguably hit the hardest by the deaths of Sara and Oliver, both former and current lovers of the legendary Arrow, both women who’ve had to sit on the sidelines and watch while everyone else got out on the field and in on the action. For characters who have sat on two completely opposite sides of the spectrum in many ways since day one, they have an assortment of deeper, even spiritual experiences in common that no other two characters could understand. So it’s both unexpected and fitting that the two of them together form the catalyst for rebuilding Team Arrow (and, a bit farther down the line, building A.T.O.M.) Laurel gets to be in the field as an integral member, and Felicity actively pushes people out there rather than simply being reactive and protective support. Hell, Felicity finally gets to play a big part of the plan that isn’t tech-support, as she’s the only one of the current team who could have the means to acquire a helicopter. Team Arrow is no longer Oliver Queen and his sidekicks, it’s a collective unite of vigilantes out to do the things no one else in Starling City can. They’re shaky at it, of course — Diggle can barely fly a helicopter, Laurel and Roy’s methods pretty much amount to “hit everything and run a lot,” and the Mayor still decides to practically annex the Glades even in spite of their efforts. But they do what they can, and as evidenced by Laurel’s clever tactical use of a voice recorder and subsequent leap out of a window and onto a helicopter ladder, they’re improving. Even if that window thing strains credulity a little bit. The Quentin issue is a curious one, because the emotional wringer that Laurel goes through keeping Sara’s death secret are the bigger emotional wallops of the hour. But it’s still rooted in a profoundly misguided decision, so it’s hard to take these scenes — however well-acted and shot — as anything but the continuation of a poorly handled story. What’s done here, with Laurel literally stepping into her sister’s shoes and mimicking her voice to keep her alive for Starling and her father, is rather artful, for what it is. And the underused Quentin is always good to see, with Paul Blackthorne’s unusually giddy and optimistic attitude dealing with Sara only twisting the knife further. But this story is going to have to reach one hell of a conclusion to shake its “Aunt May excuse” roots for Quentin’s heart. 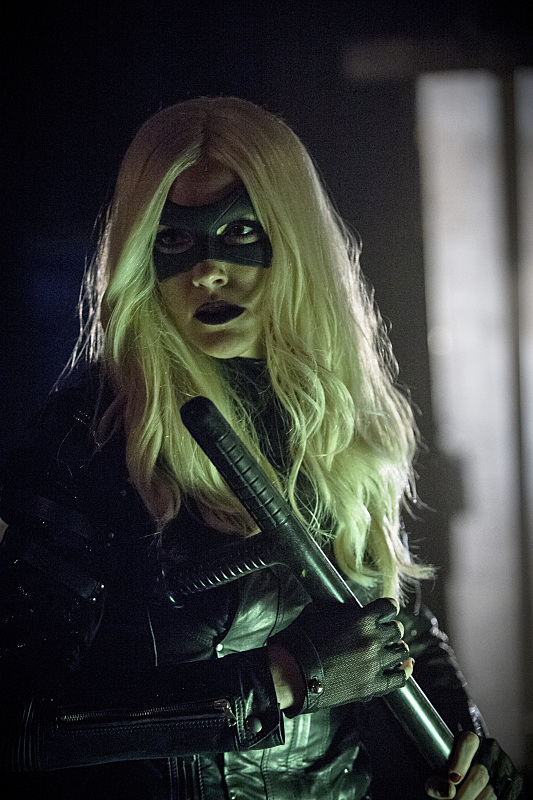 Whatever progress Laurel has made, she’s dug herself in an extremely deep hole, and it’s bound to come back and bite her no matter how well she performs as the Canary later down the line. And, of course, Oliver is still present in a bigger capacity than any of us expected. But things continue to take a sharper turn, with the flashback quickly achieving its perceived happy ending. With Tatsu rescued and the virus not in the hands of the bad guy, what events are so terrible that they turn Maseo into the self-mutilating League assassin he is today? The foregone conclusion brings in a ton of tension and excitement that was missing from the Hong Kong flashbacks, and the integration of these characters in the present day is sure to provide ample more drama than previously. It’s another aspect of the season heavily stepping up after its shaky first half, delivering on set-up we didn’t even know was there. “Midnight City” doesn’t carry the emotional weight or freshness of “Left Behind,” and without the Arrow grounding them, the more chaotic action sequences are not on par with those from the past. But the episode circumvents the former by running headlong with the plot, and justifies the latter with those shakier and rougher sequences matching the chaos Team Arrow and Starling is in now. Where the episode excels how it all ties nicely on the thematic level. It’s the classic Arrow style of taking an old superhero adage an breaking it down in full detail, exposing every wrinkle and crevice it possibly can. All superheroes sacrifice for the greater good, which we usually see reflected in employment problems or romantic drama. “Midnight City” goes alternate routes, defining what the “greater good” actually is, in Felicity’s realization that that it’s letting people help other people not suffer and die. It shows the opposite of greater good in Maseo, who threatens the whole city for the sake of his wife. 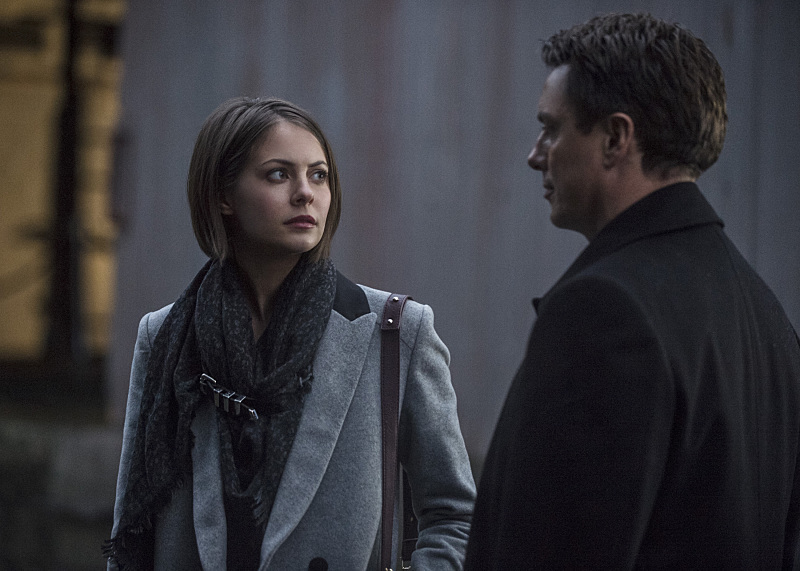 It shows how narrow the focus is when the greater good is not the goal, in Malcolm and Thea’s square focus on themselves and their own survival. And Laurel and Ray’s actions address the fact that actual people trying to fight for the greater good are inherently in a lot of danger, but making a difference isn’t possible without risking things once and a while. That last type of idea can work for life as a whole, in a lot of ways. But this is Arrow, so we’re going to see it played out in the most action-packed, leather-clad, exciting edge-of-your-seat fashion. Always good to see Kelly Hu back as China White. Really enjoyed Laurel in this episode, except her sleezy lawyer stuff (threatening to make up a case file on a guy? What?) The show has always been weird about how it handled her lawyer activities, sometimes presenting them as admirable but other times having her blackmail her way to the top and presenting it as being a-ok. It’s not that Laurel’s aggressive attitude isn’t warranted given the circumstances, and technically she’s bending the law as the Black Canary as much as she was in that interrogation room. But it’s hard to tell what that’s rooted in, unlike her need to attack bad guys directly with her fists, which is pretty straightforward. Katie Cassidy is also just not very good as the slimy lawyer type, while she’s much more fun when in on the action. So, what does Malcolm do all day when he’s not deviously plotting or swordfighting with Thea? Brick’s rampage is compared to Al Capone’s crime spree, and Brick himself compares the police’s reaction — to completely pull out and abandon the city — to the 1992 LA Riots. With the latter, there’s a clearly stated, but still muted, undercurrent that calls to real world questions of police militarization and urban class segmentation. “Midnight City” is actually quite competent at pulling these things in without taking a stance one way or another; Ray is clearly for police militarization, the Mayor is willing to throw out the Glades, but her argument isn’t completely invalid because both the police and the vigilantes are failing to make significant dents until the end, etc. It’s seems to be integrated because that’s just a part of our culture that’s talked about, and Arrow carefully handles these subjects without going too hard or too soft. It’s not equipped to deal with these things, so it’s color and realism for the story more than any kind of statement. The “helicopters don’t have keys” bit between Ray and Felicity is very funny. 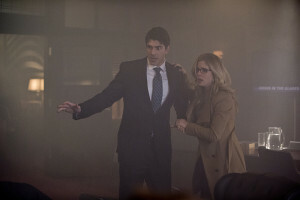 Such great comedic chemistry between Brandon Routh and Emily Bett Rickards. Felicity finds Ray a “quantum processor,” which, while not a thing that really exists yet, is something that can theoretically exist. So this actually isn’t a case of TV writers slapping two nonsensical science-sounding words together to sound cool, oddly enough. It’s brief, but I thoroughly enjoyed the scene of Diggle and Roy having a drink together and quoting a Russian word Oliver says…and neither have any clue what it means. There’s a real sloppy, ramshackle feel to the episode, like it’s barely holding itself together at the seams to carry on. It was very noticeable in the indelicately edited preview clip of Brick’s attack on the Mayor’s meeting that they released earlier in the week. That scene seemed a bit cleaned up in final airing but not by much. I was disappointed in the clip for that and had hoped it wasn’t indicative of the episode itself. Oh, but it was. Then, it started to click. What at once felt amateurish actually lived and breathed the nature of the story being told, much like an aesthetic choice in set or costume reflecting tone. Laurel was stumbling through trying to do right for the city because she just doesn’t have the skill set for it yet, barely scraping by. Even Maseo and Oliver’s gambit to get Tatsu back in Hong Kong had a dangerous, ad-libbed quality. I’m not sure if the final visual of the episode was intentional, but it worked for the story. Well, most of it did. You still get silly looking scenes like Laurel’s Canary jumping through a window to latch onto a rope ladder hanging from the Palmer helicopter. The shot from the street looking up as they ascended was nigh comical. And a few of the wide-angle shots of Laurel’s blunders, like awkwardly landing on the top of the van, felt a bit home-video like. I’m not sure which side of working those teetered to. The interesting thing is that the whole “junior crimefighter” feel sharply focused, maybe even for the first time, the TEAM aspect of Team Arrow. Oliver became stronger at what he was doing when Diggle and Felicity both came aboard, and they’ve never shied away from it all being a team effort. Yet, it was always clearly understood that the Arrow was the point, no pun intended. Even with Dig or Sara or Roy in the field beside him, this was Oliver’s show. This chapter it felt like a force, and I enjoyed the dynamic. I like that it’s Laurel who is the catalyst for bringing everyone back together, something that has to ruffle many feathers amongst the fandom and audience. The team’s concern for her well-being allows them to put perspective back on the mission and rousts everyone from their doubts. Felicity trusting both of these rookies, Laurel and Ray Palmer, might be a bit eye-rolling for some, but she recognizes the need, the passion, and the opportunity. One thing the show has never been afraid to explore is the failure of heroes. Particularly as these are non-superpowered people, mistakes are going to be made, and the show embraces that. Roy and Laurel dropping the ball and Brick executing one of the alderman as a result was appropriate. That each of the field members has tousled with this guy and lost is great set-up for the last of the three episodes in this arc. It’s as much character-oriented as plot-driven, and it perfectly frames the stakes for these people not just in the immediate but in going forward with their lives. While I will forever be a proponent of serialized storytelling with long arcs, I’m enjoying this three-episode villain arc and hope it’s a format they explore more of in the future. It fulfills its own pocket of existence while feeding into the larger narrative of the season. There’s always the potential to stray, which wouldn’t be good, but allowing us to live with a villain for more than an hour can be quite engaging. We also get more intrigue with Maseo and Tatsu and left wondering just what happened that caused them to split. As the show often does, it supplants expectations by eating through plot unexpectedly. Tatsu’s capture by China White easily could’ve played out the rest of the season. Yet, they’ve already managed to get her back. Where does that lead us, and just what is Maseo doing with the League? Did he infiltrate it for his own purpose? Is he actually helping Oliver at the behest of Ra’s al Ghul, seeming to be running counter to the League but really guiding him in a direction that best serves Ra’s plans? Is Malcolm Merlyn the endgame for Ra’s, and Maseo and DJ Annoying Guy — his reveal as part of the League was all but assured from the beginning — the tools to put everything in place? This might be a silly comment, but this was kind of the hour of great hair. Felicity’s new style really worked well, not just for the character but for Emily Bett Rickards. And I know there are many who don’t care for the long-haired wig Amell wears for Oliver in the flashbacks, but I thought it looked rather stylish at various points in the hour. It also made me realize something that others might have already cottoned to. It’s been bothersome that Oliver hasn’t cut his hair now that he’s in civilization, seeming to be an odd choice that speaks to his grizzly look when he’s finally rescued from the island after five years. Two things became very clear in the nightclub scene with the meeting/exchange with China White. One, longer hair fits the culture of Hong Kong better; and two, Oliver is still hiding himself in plain sight. Shorter or buzzed-haired Oliver, clean-shaven, could possibly be recognized, potentially blowing his cover. It’s primarily a disguise at this point and that works very well for the narrative. “Midnight City” is not everyone’s cup of tea. For those that think the development of Laurel in a mask is foolhardy, this could easily be an episode that you avoid or causes you to give up on the whole venture. For those that enjoy and welcome the evolution of the character, this is, in many ways, a shining example of the show’s approach to it. Laurel out in the field is rushed and the hour doesn’t sugar-coat it. The team gets behind her because they know she’s just going to go out there on her own and would be better off supporting her to make her better. It also places the team back on point, and sets up an interesting dynamic for when Oliver returns.